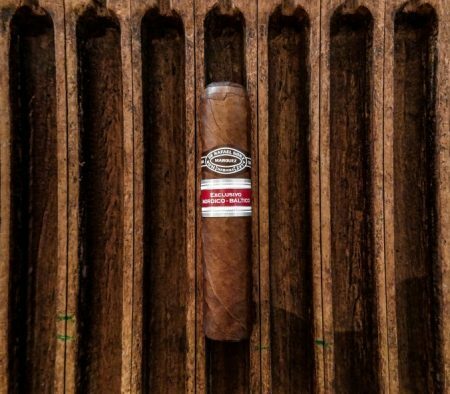 Our dear friend from Sweden who runs another interesting blog (click here), just shared with us his review of the new Regional Edition cigar from Habanos Nordic. Cold draw: Light wood notes and nuttiness. 1st third: Starts with a oak wood heavy note, followed by salty peanuts and freshly ground coffee. 2nd third: Keeps the oak wood notes, but the other notes now turn to a toasted bread and lightly roasted hazelnuts. There is also a faint hint of sweetness that lingers in the aftertaste. The burn: Burns steady and fairly sharp with a white-ish ash. Smoke: Medium voluminous smoke with a medium to cool feeling on the tounge. The draw is a classic Cuban draw, a little tighter but still perfect. 3rd third: Keeps previous flavors and also I’m getting a peppery feeling on the lips. Conclusion: Medium bodied cigar with a medium strength profile. Perfect for an late afternoon or evening smoke. It reminds me of an Montecristo but without the chocolate and earthy notes. Think this would match perfectly with a dark rum, I’m thinking a Havana Club 15 year old, or a cup of coffee.